Using three N8s and a lot of sand, Sumo Science and Aardman land a Guinness Record for largest stop motion set, and a great looking spot. Less than a year after making the world’s smallest animation, Nokia just ticked off that large, lurking item on the to-do list: conjuring the world’s largest stop motion animation. The new film, Gulp, tells the simple story of a fisherman who gets swallowed by a larger predator. It was shot entirely with the Nokia N8 phone. 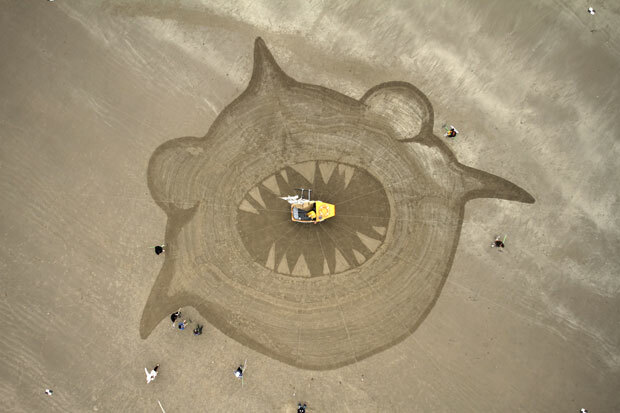 “Strapping the device to a 40-meter high cherry picker on a massive expanse of beach with gale force winds seemed like a good challenge for the smartphone,” says David Bruno, a creative at Wieden + Kennedy London which created the spot along with directing team Sumo Science, from animation studio Aardman, and sand artist Jamie Wardley, from sand and ice sculpture specialists, Sand in Your Eye. Sumo Science, aka Ed Patterson and Will Studd, director of photography Toby Howell and Wardley, literally fought time and tides over the five-day shoot to complete the painstaking animation process before the sea wiped out their efforts. The team used stencils, modded rakes, and a crew of sand artists and volunteer animation students to create the sand shapes and characters that brought the narrative to life. Last September, W+K London earned buzz for the smallest ever stop motion animation, Dot, also filmed with an N8 equipped with Cellscope, a microscope imaging device. Watch the Making of Gulp below.